the use of lighted candles on the altar; facing “eastward”; mixing water and wine in the chalice; reciting the Agnus Dei; making the sign of the Cross in blessing; and making a ceremony of cleansing the Communion vessels after the service. The Ordinary, Fr Keith Newton, writes about Lent for those preparing to be received into full communion at Easter, Joanna Bogle has a piece about Blessed Jermyn Gardiner, the last martyr to die under King Henry VIII, and there is a good series of short answers by Fr Mark Woodruff to common questions and objections raised to the Ordinariate. 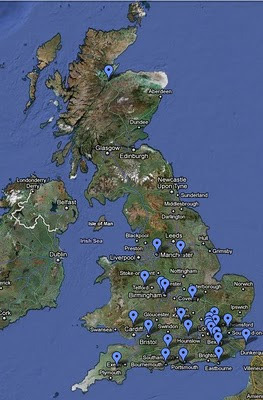 The screen grab above is from the new Personal Ordinariate of Our Lady of Walsingham Google map which shows the locations of the groups so far. If you go to the map, you can find links to the various groups.